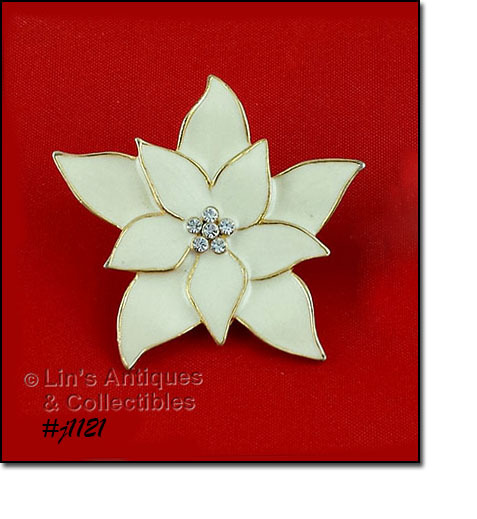 THIS EISENBERG ICE LISTING HAS A BEAUTIFUL IVORY COLOR POINSETTIA PIN! IT’S IVORY COLOR ENAMEL WITH CLEAR RHINESTONES CENTER. PIN MEASURES 2” X 2” AND IS MARKED EISENBERG ICE. 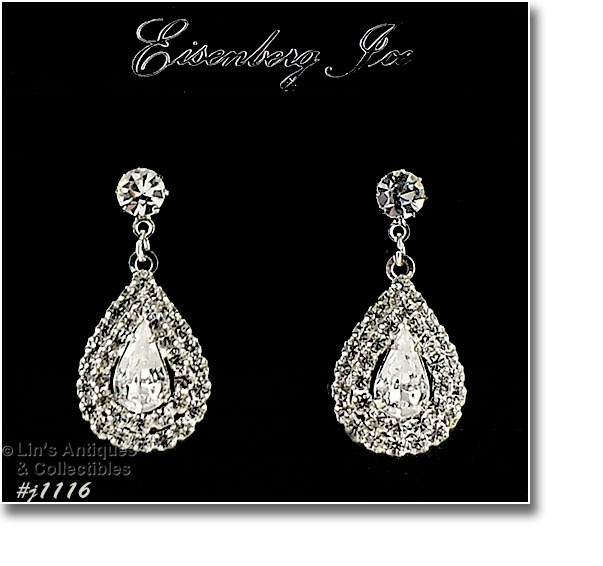 ABSOLUTELY BEAUTIFUL EISENBERG ICE EARRINGS IN THIS LISTING! EARRINGS ARE LOVE KNOT SHAPE, SILVER-TONE WITH CLEAR SPARKLY RHINESTONES, AND ARE PIERCED STYLE. THEY MEASURE 3/8” DIAMETER AND ARE TOO SMALL TO BE MARKED, HOWEVER, THEY ARE STILL ON THE ORIGINAL STORE HANG/DISPLAY CARD – NEW OLD STOCK, NEVER WORN. EARRINGS MEASURE 1 5/8” X 1 1/8” AND ARE MARKED ISENBERG -- THERE IS NO ROOM FOR THE E AND IT IS NOT UNUSUAL TO FIND EISENBERG EARRINGS MARKED IN THIS MANNER. 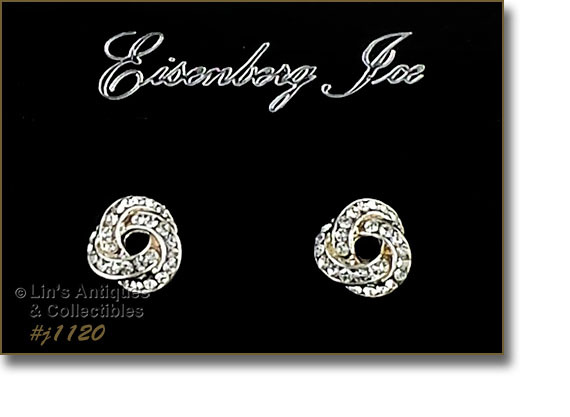 ANOTHER GORGEOUS EISENBERG ICE PIERCED EARRING LISTING! THESE ARE CLEAR PRONG-SET RHINESTONES WITH FAUX PEARL DANGLES. THE EARRINGS MEASURE 1 1/8” IN TOTAL LENGTH (THE FAUX PEARL DANGLE MEASURES 1/2”). 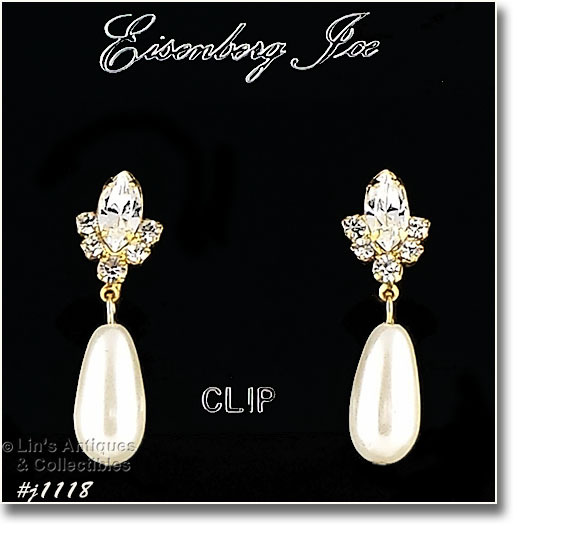 BECAUSE OF THEIR SHAPE AND SIZE, EARRINGS ARE UNMARKED BUT ARE STILL ON THE ORIGINAL EISENBERG ICE STORE HANG/DISPLAY CARD, NEW OLD STOCK, NEVER WORN. 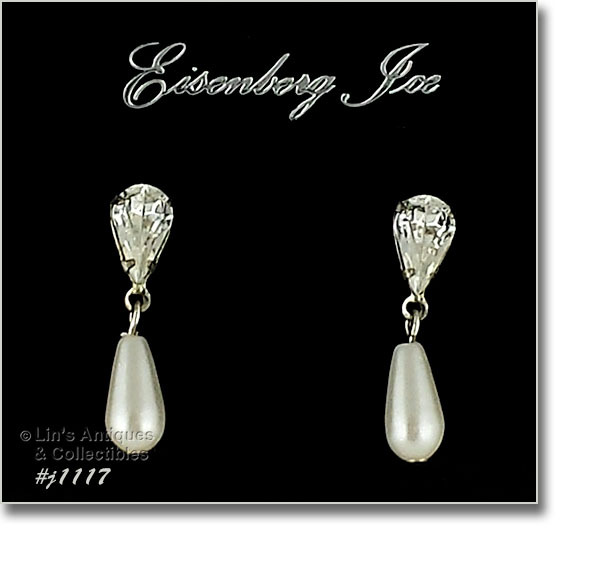 THIS LISTING HAS EISENBERG ICE EARRINGS PERFECT FOR AN EVENING OUT OR A WEDDING – THEY ARE UNDERSTATED ELEGANCE! EARRINGS ARE SILVER-TONE AND ARE COVERED WITH PRONG-SET CLEAR SPARKLY RHINESTONES. THEY MEASURE 1 1/4" X 3/4". DUE TO THEIR SIZE AND SHAPE, THEY ARE UNMARKED BUT ARE STILL ON THE ORIGINAL EISENBERG ICE STORE HANG/DISPLAY CARD, NEW OLD STOCK, NEVER WORN. 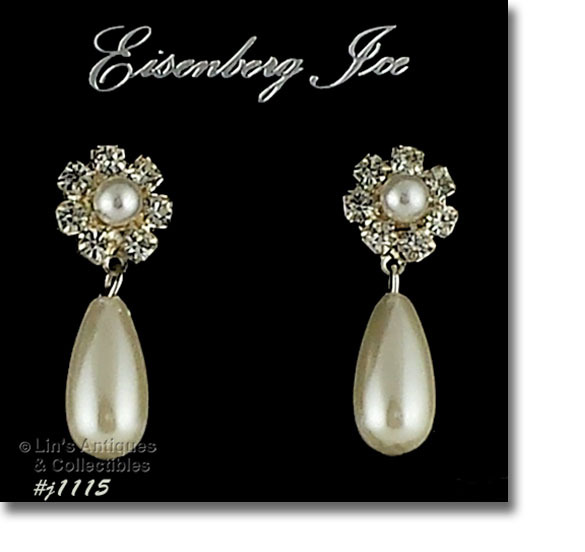 CLASSY, ELEGANT EISENBERG ICE EARRINGS – THESE ARE CLEAR RHINESTONES WITH FAUX PEARL DANGLES! THE TOTAL LENGTH OF EARRINGS IS 1 1/4" (THE PEARL DANGLE IS 5/8”). 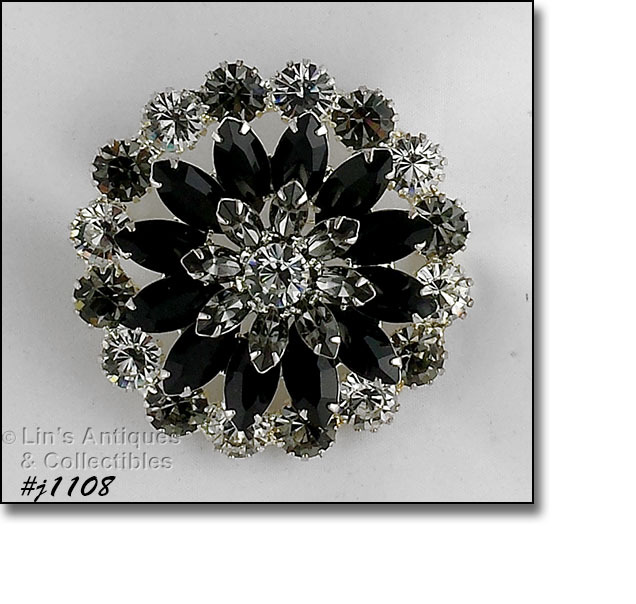 THE RHINESTONE PORTION IS 1/2" DIAMETER. THE RHINESTONES ARE PRONG-SET AND THERE IS A SMALL FAUX PEARL CENTER. ANOTHER PAIR OF BEAUTIFUL EISENBERG ICE PIERCED EARRINGS! 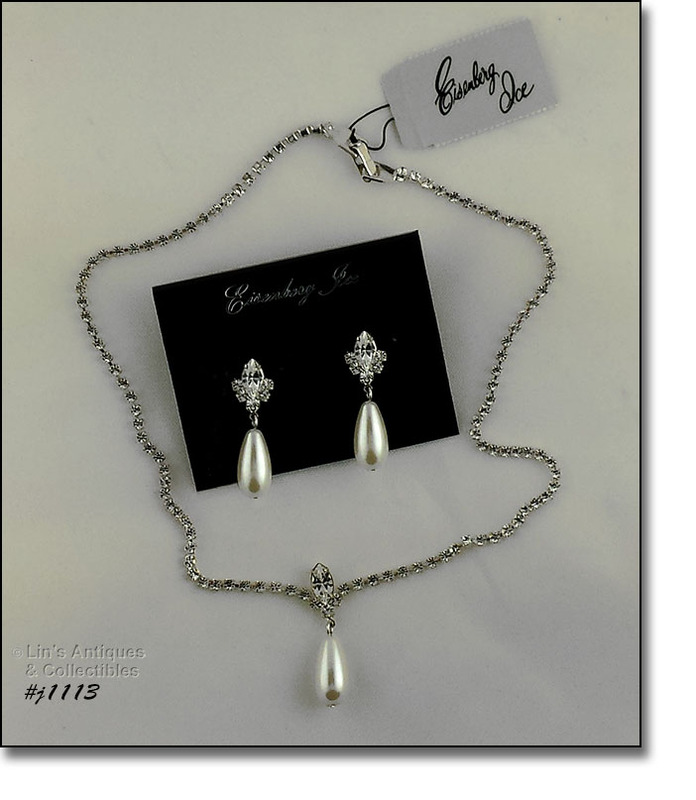 THEY’RE SILVER-TONE WITH 3 CLEAR ROUND PRONG-SET RHINESTONES WITH A FAUX PEARL DANGLE. EARRINGS MEASURE 1 1/4" IN TOTAL LENGTH (THE FAUX PEARL IS 1”). NONE ARE MARKED BUT THE NECKLACE HAS THE ORIGINAL EISENBERG ICE PAPER TAG/LABEL AND THE EARRINGS ARE STILL ON THE ORIGINAL STORE HANG/DISPLAY CARD. ALL ARE NEW OLD STOCK, NEVER WORN. ABSOLUTELY GORGEOUS EISENBERG ICE EARRINGS IN THIS LISTING – THESE ARE AMONG MY FAVORITES! EARRINGS ARE LOVE KNOT SHAPE, GOLD-TONE WITH CLEAR SPARKLY RHINESTONES, AND ARE PIERCED STYLE. EISENBERG ICE PRODUCED SOME LOVELY CHRISTMAS WREATH SHAPED PINS – THIS IS ONE OF THE PRETTIEST! THE WREATH IS GREEN RHINESTONES WITH A CLEAR RHINESTONE BOW THAT HAS A RED RHINESTONE CENTER. IN THE CENTER OF THE WREATH IS A CLEAR SINGLE BAGUETTE RHINESTONE “CANDLE” THAT HAS A SINGLE MARQUISE SHAPED TOPAZ COLOR RHINESTONE “FLAME”. THE WREATH MEASURES 1” DIAMETER, THE CANDLE MEASURES 1/2”, AND PIN MEASURES 1 1/2" AT LONGEST MEASUREMENT. PIN IS GOLD-TONE, ALL RHINESTONES ARE PRONG-SET, AND IT’S MARKED EISENBERG ICE. 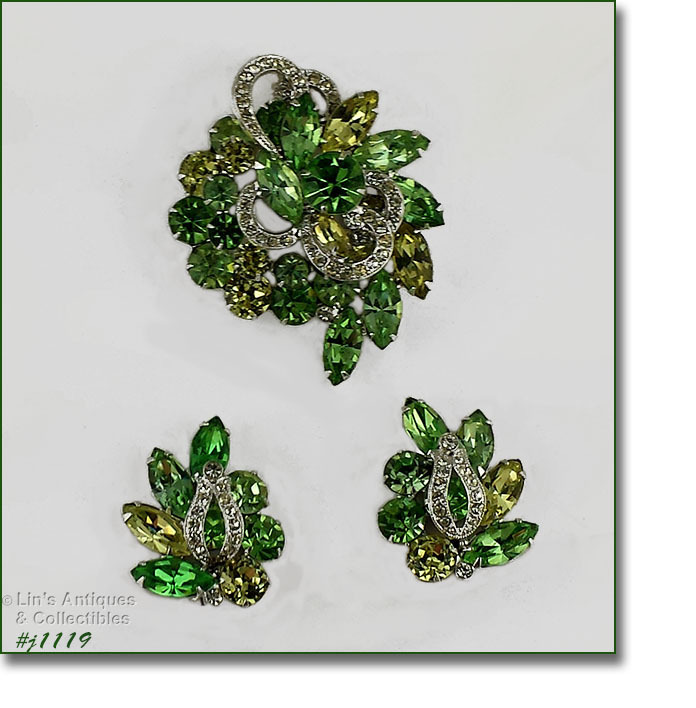 GORGEOUS EISENBERG ICE EARRINGS IN THIS LISTING! THEY’RE STAR SHAPED, SILVER-TONE, AND COVERED WITH CLEAR SPARKLY PASTE SET RHINESTONES! 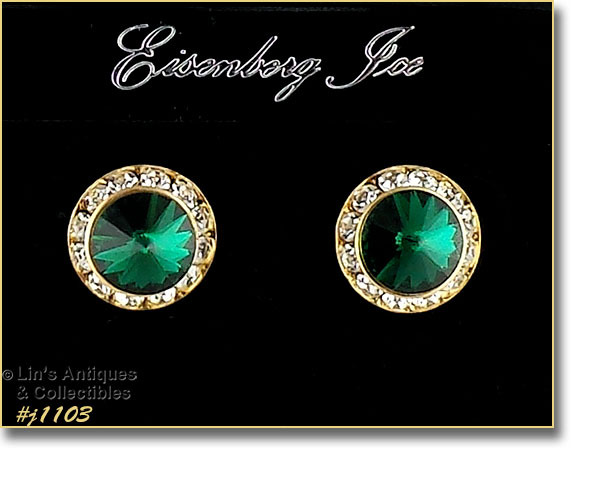 EARRINGS ARE CLIP BACK STYLE, MEASURE 1 1/2" X 1 1/2", AND ARE MARKED EISENBERG ICE. 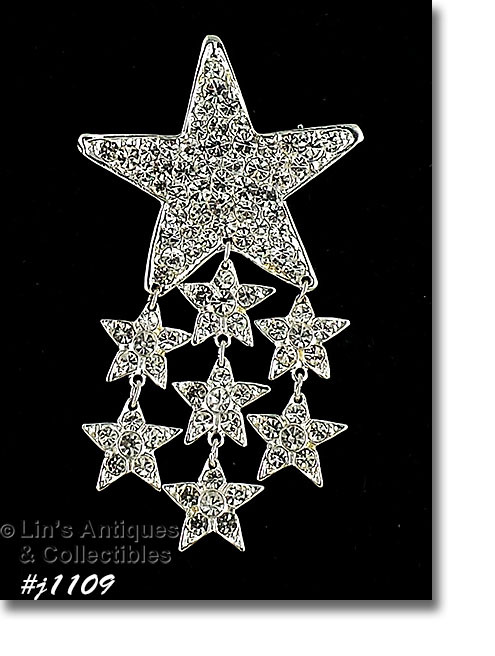 EARRINGS COORDINATE BEAUTIFULLY WITH OUR INVENTORY #J1109, STAR PIN! THIS IS AN EISENBERG ICE PIN IS A SPARKLER -- IT’S A LARGER STAR WITH ATTACHED SMALLER STAR DANGLES! THE LARGER STAR MEASURES 1 3/4" X 1 3/4", THE SMALLER STARS ARE 1/2" X 1/2", AND TOTAL LENGTH IS 3 1/8”. ALL STARS ARE SILVER-TONE AND COVERED WITH CLEAR PASTE-SET RHINESTONES. PIN IS MARKED EISENBERG ICE. WOW – THIS IS AN ABSOLUTELY BEAUTIFUL EISENBERG ICE PIN! IT’S ROUND SHAPE, MEASURES 2 1/4” DIAMETER, AND IS MARKED EISENBERG ICE. THE PRONG-SET RHINESTONES ARE BLACK, GRAY, AND CLEAR – A STRIKING DISPLAY ON A LITTLE BLACK DRESS, A GRAY LAPEL, OR ANY OUTFIT THAT NEEDS SOME ELEGANT SPARKLE! 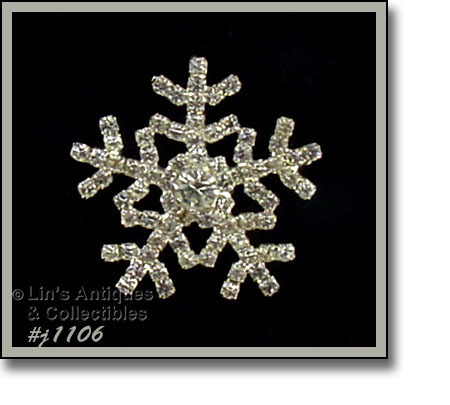 THIS LISTING HAS AN EISENBERG ICE SNOWFLAKE PIN – COMPLETELY COVERED WITH PRONG-SET CLEAR SPARKLY RHINESTONES! PIN MEASURES 1 3/8” DIAMETER AND IS MARKED EISENBERG ICE. THESE EISENBERG ICE SNOWFLAKE EARRINGS ARE SO SPARKLY! 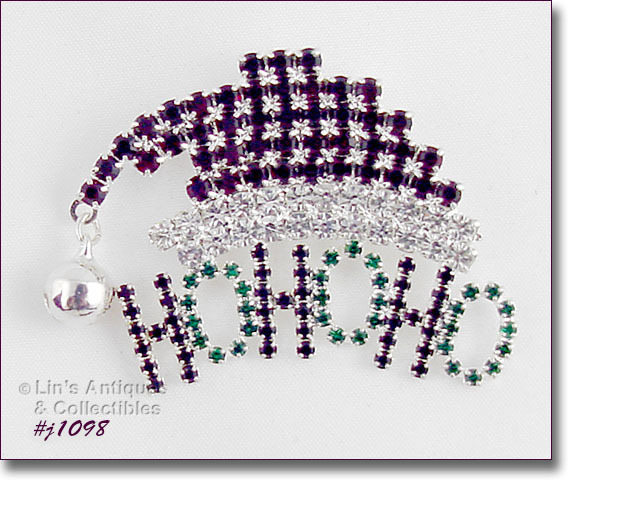 EARRINGS ARE SILVER-TONE, PIERCED STYLE, AND ARE COVERED WITH CLEAR PRONG-SET RHINESTONES. THE SNOWFLAKES DANGLE FROM A SINGLE CLEAR PRONG-SET RHINESTONE. THEY MEASURE 1 3/8” IN LENGTH. THE SNOWFLAKE MEASURES 1” X 1”. EARRINGS ARE NOT MARKED BUT ARE ON THE ORIGINAL STORE HANG/DISPLAY CARD. THEY ARE NEW OLD STOCK, NEVER WORN. 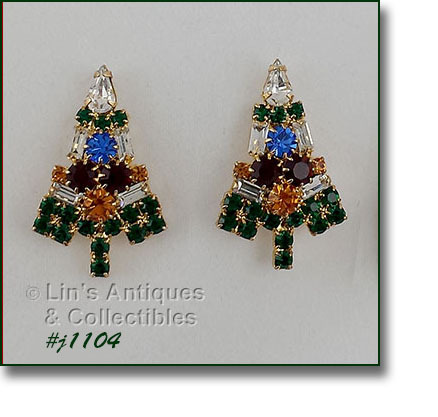 THIS LISTING HAS A BEAUTIFUL PAIR OF EISENBERG ICE CLASSIC CANDLE TREE EARRINGS! EARRINGS ARE PIERCED STYLE AND MEASURE 1 1/8” X 3/4". THEY ARE UNMARKED BUT ARE STILL ON THE ORIGINAL STORE HANG/DISPLAY CARD – NEW OLD STOCK. 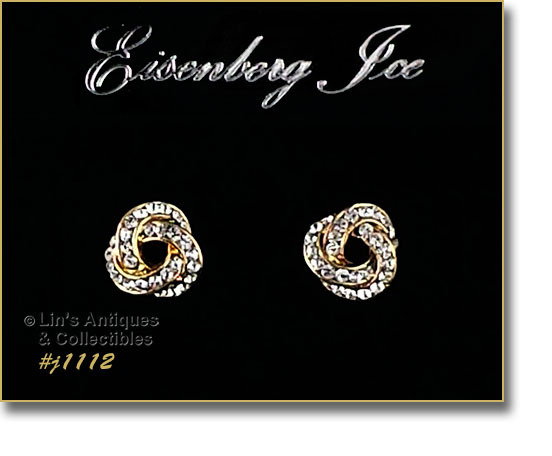 THIS LISTING HAS A BEAUTIFUL PAIR OF EISENBERG ICE PIERCED EARRINGS! 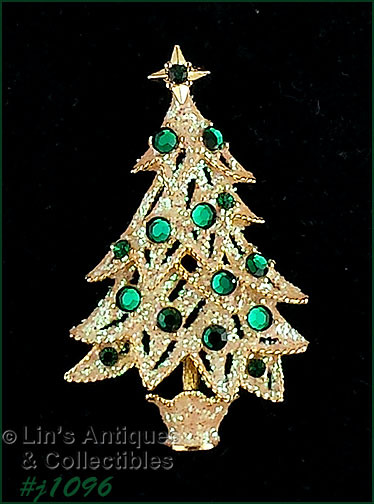 THE CENTER RHINESTONE IS INVERTED AND IS A BEAUTIFUL EMERALD GREEN. IT IS SURROUNDED WITH CLEAR RHINESTONES. EARRINGS MEASURE 5/8” DIAMETER. THEY ARE UNMARKED BUT ARE ON THE ORIGINAL EISENBERG ICE STORE HANG/DISPLAY CARD. LIKE THE MAJORITY OF MY EISENBERG ICE LISTINGS, THESE ARE NEW OLD STOCK, NEVER WORN. 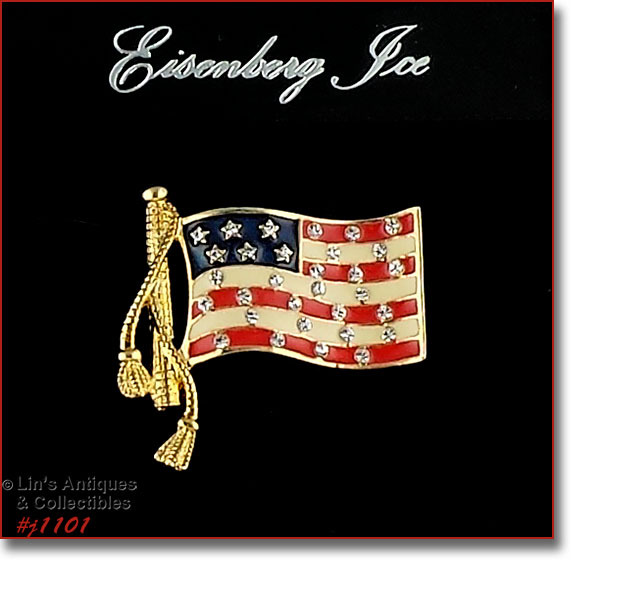 THIS EISENBERG ICE FLAG PIN IS COVERED WITH PRONG-SET RED, WHITE, AND BLUE RHINESTONES! PIN IS GOLD-TONE, MEASURES 1 1/4" X 3/4", AND IS MARKED EISENBERG ICE. IT IS STILL ON THE ORIGINAL STORE HANG/DISPLAY CARD. 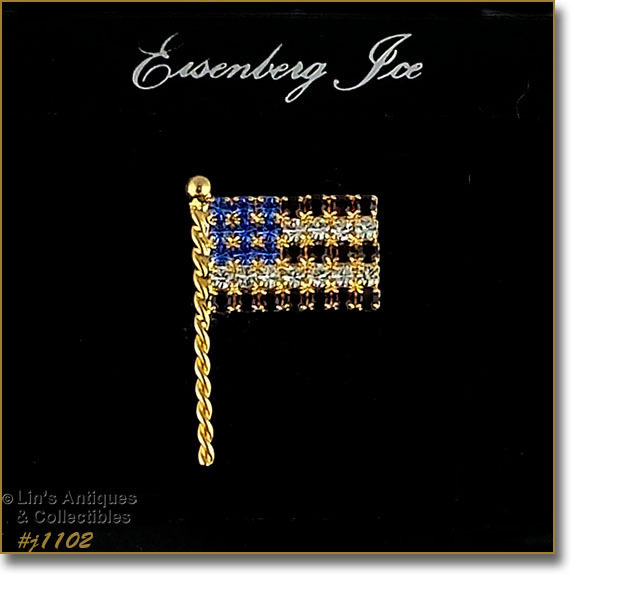 THIS LISTING HAS AN ATTRACTIVELY STYLED EISENBERG ICE PATRIOTIC PIN – IT’S A FLAG! PIN HAS RED, WHITE AND BLUE ENAMELING ACCENTED WITH CLEAR RHINESTONES. IT’S GOLD-TONE, MEASURES 1 1/4" X 1 1/8”, IS MARKED EISENBERG ICE, AND IS STILL ON THE ORIGINAL STORE HANG/DISPLAY CARD. THIS PIN HAS A TIE-TACK STYLE BACK. 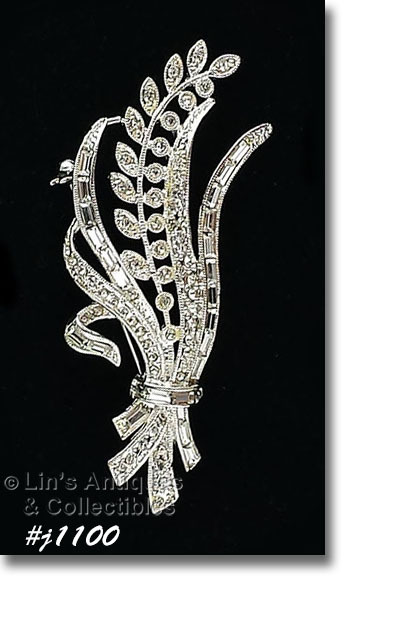 A BEAUTIFUL EISENBERG ICE PIN – SILVER-TONE WITH CLEAR RHINESTONES BOUQUET STYLE PIN! 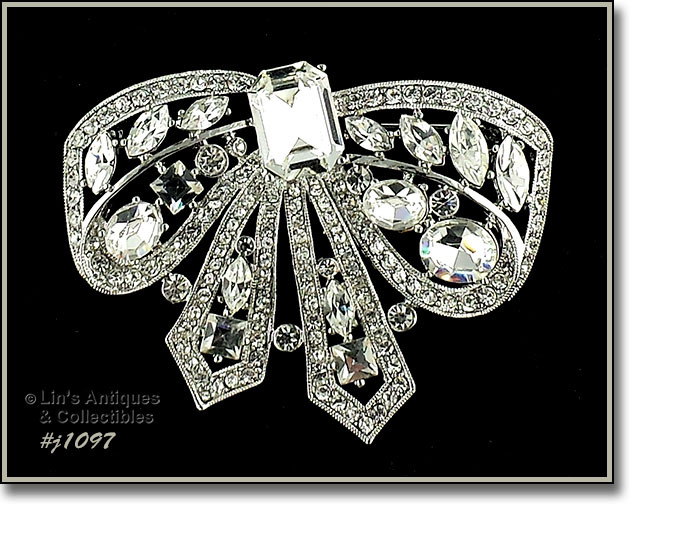 IT HAS SPARKLY ROUND AND BAGUETTE CLEAR RHINESTONES, MEASURES 3” X 1 3/4", AND IS MARKED EISENBERG ICE. THE SHAPE OF THIS PIN IS ESPECIALLY PRETTY WITH 1 “FLORAL” STEM AND THE REST APPEARING TO BE LONG LEAF BLADES. THE BOUQUET HAS A ROUND BAND OF BAGUETTE SHAPED CLEAR RHINESTONES AT BOTTOM – JUST LOTS OF DETAIL!